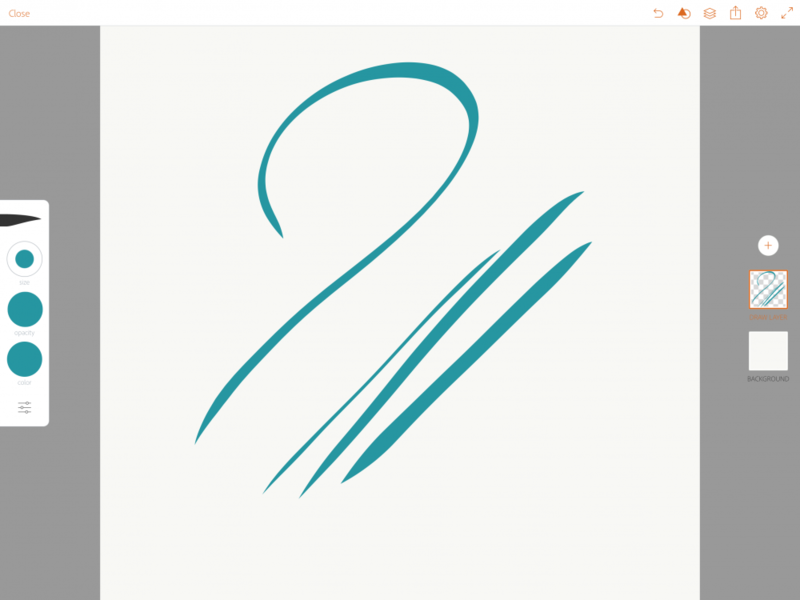 ...exactly like the brush in Adobe Draw. 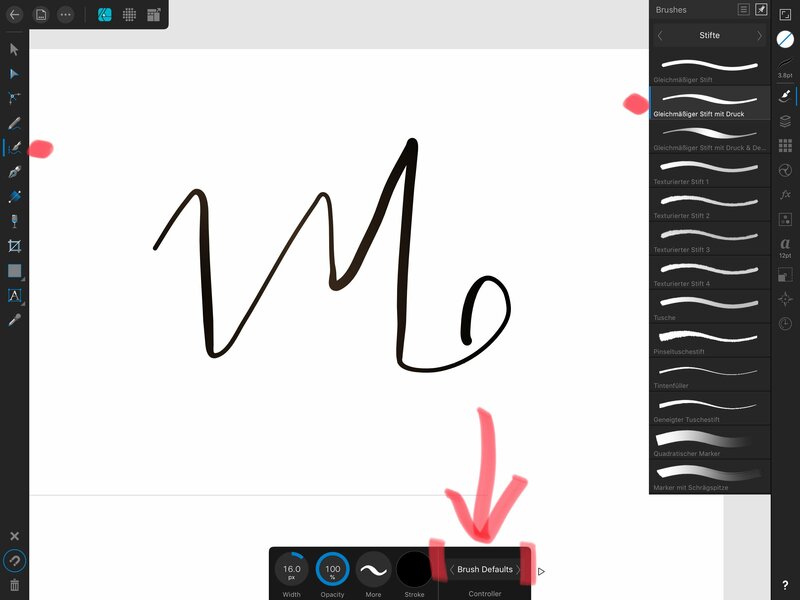 No matter what settings I adjust in either vector brush or pencil in Affinity Designer, I cannot get a tapered brush that also works with pressure control. I can get the taper at both ends if I switch pressure off, but then every stroke is the same width. Please help! Maybe someone could send me a working brush if I’m doing it wrong! This alone would see me move away from Adobe Draw, and ultimately Illustrator. did you set the controller? What did you set the controller to? 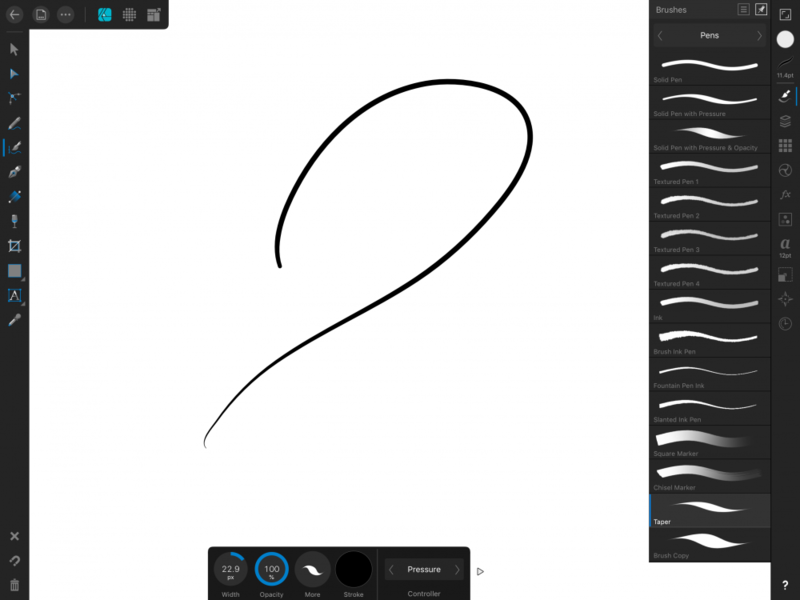 Why can’t a free app give me the simplest of brushes and a paid app cannot? See the attached sample. Pencil work, with Sculpt turned on. Vector, w. brush dynamics adjusted to have size variation. Both using the default pressure curve. What you want to do is use the Pencil Tool and adjust the settings in the Stoke Studio. I'll attach some examples. With the right settings, you'll be able to get a perfect taper every time. Sebastian C.'s approach works very well. As far as I can tell, the stroke pressure adjustments are only available within the document. 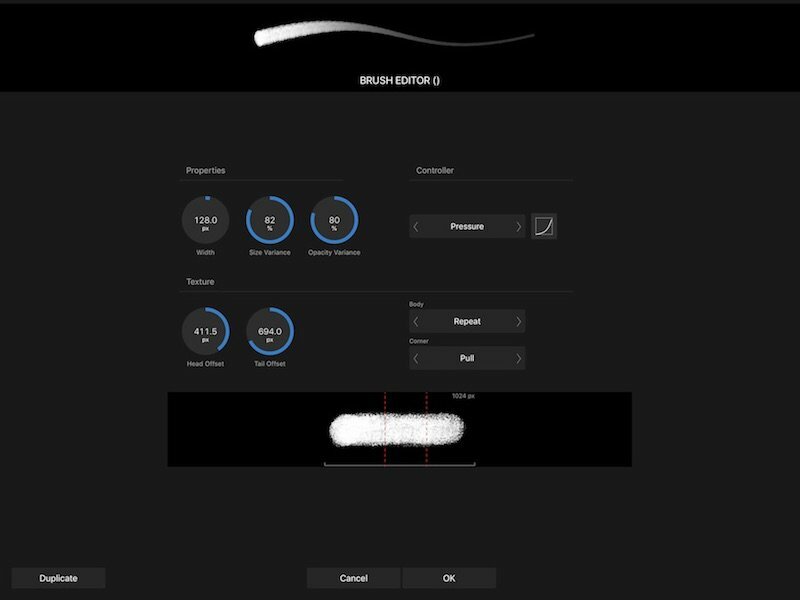 The desktop version allows multiple pressure profiles to be saved and assigned from the stroke panel. 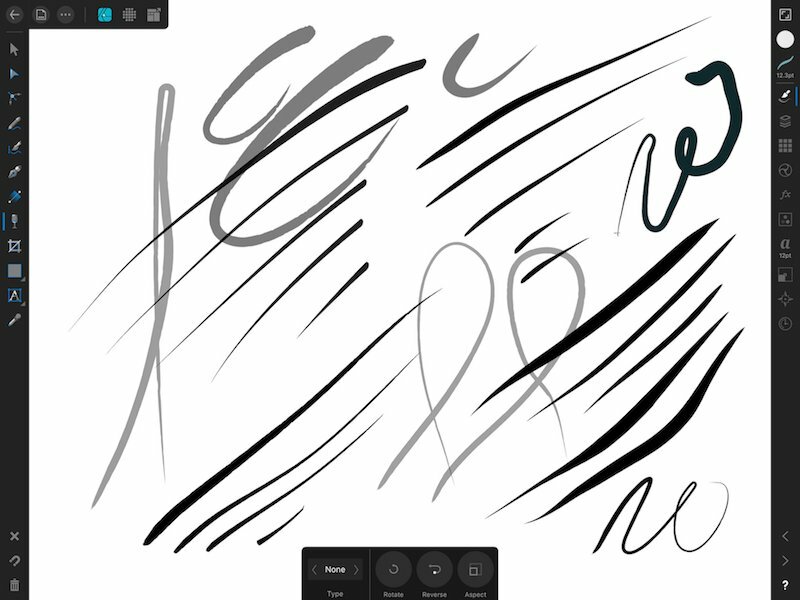 In the iPad version, I've only been able to transfer the pressures by "copy/paste style" between different strokes. The desktop version allows the stroke pressure curves to be saved as layer styles, and available to all documents. So far I've found no way to do that in the iPad version. Perhaps a feature request is in order. I can achieve this style of taper, but what it doesn’t give me is pressure adjustment - I don’t want every stroke to have the same thickness. It seems silly - it means for my workflow I have to continue to have a Creative Cloud subscription - I have to do my linework in Adobe Draw, export it to Adobe Illustrator, then save and import into Affinity Designer, which kinda makes Designer of no use to me. This is a known issue that already logged to be looked at. I was looking at the screen cap from Draw, and had a thought. I'd been working on some textured image brushes for use w. the vector brush that would emulate wood cut strokes. Tried them out, and thought they might be worth a look. They seem to respond to pressure pretty well, and this was just the 1st trial. So, has this been fixed if an issue or added as a feature? Haven’t and can’t use this program (despite already purchasing) until this is sorted. Again, I ask if this has been fixed for the iPad version? 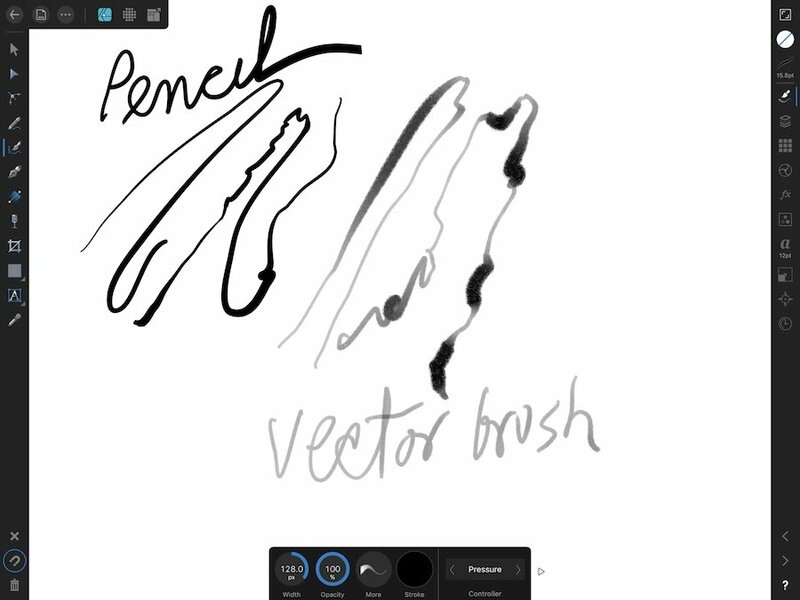 Havent used it since I bought it and could not get pressurised taper brush to work like it does in Adobe a Draw.